This chili can be done on the stove top or in a slow cooker. Just remember that the prep time is a bit lengthier as you need to cut a lot of vegetables and soak the beans overnight if you’re using dry beans. However, once everything is ready to go, it’s just a matter of letting everything cook to perfection! 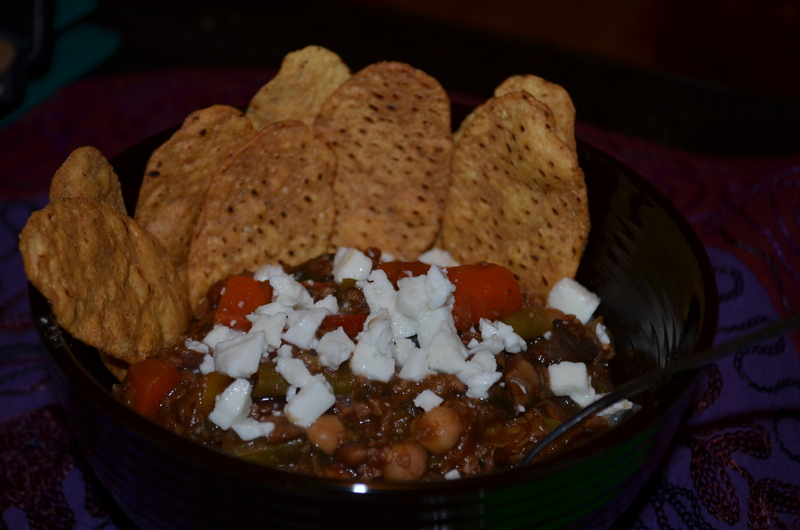 Vegetarian chili served with fresh goat feta and sweet potato chips. 1/3 cup each of 5 types of beans: choose from white kidney, red kidney, chickpeas, northern white, black or regular soya, mung, adzuki… the options are endless! 1. Soak the dried beans overnight or boil on high heat for at least 3 hours. Drain the liquid and reserve until you are ready to cook. 2. Wash all your vegetables and peel the carrots. Chop your vegetables into bite-sized chunks, about 1/2 an inch thick. Chop the garlic into smaller pieces. 3. Combine all of the liquid ingredients and the spices in a bowl and stir to combine. Add all of the vegetables and beans to the slow cooker, then pour the liquid over them. Top up the slow cooker with water if necessary. Cook on low heat for 6 to 8 hours, until vegetables and beans are cooked fully through. Follow all of the instructions, but place the ingredients in a large pot instead of a slow cooker. Bring all ingredients to a boil over medium heat, then reduce the heat and simmer for 5 to 8 hours, until vegetables and beans are cooked fully through. This entry was posted in Dairy Free, Entrées, Grains, Legumes, Slow Cooker, Vegan, Vegetables, Vegetarian and tagged beans, chili, crock pot, green beans, lentils, mushrooms, peppers, slow cooker, spinach, tomatoes, TVP, vegan, vegetables, vegetarian by laratboulos. Bookmark the permalink.